Recently, I moved from Windows 10 to unRAID for the storage server. 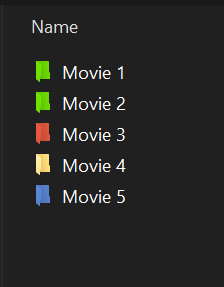 I used to change the folder icons of my movies and TV shows with different colors to mark them as: Watched, To be watched next, not completed. After moving my data to unRAID, the icons didn't work as expected. I did a quick research and found that Linux doesn't treat the "Read Only" files same as Windows, so the "desktop.ini" and ".ico" files don't work. Is there any work around or a solution for this issue? any suggestions? Perhaps something alone the lines of this? Note: restarting samba itself didn't work, it worked only after rebooting unRaid.